FOI Man sums up what he told the Justice Select Committee as they prepare to carry out their post-legislative scrutiny. Tomorrow, Friday 3 February, is the deadline for submissions of evidence to the Justice Select Committee for their post-legislative scrutiny. After days of writing – and rewriting – my despatch, I finally sent it off on Tuesday. 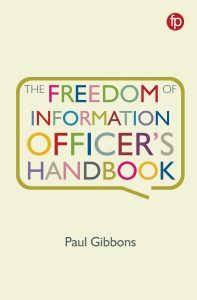 Hopefully many of you have written to say how important you think FOI is, and why. The rules of the Committee mean that I’m not allowed to publish my full statement here without permission – I’ve asked the Clerk of the Committee to allow that. However, in the meantime I can summarise the key points I made. Most of this won’t be a surprise to regular readers. Fundamentally, I think the FOI Act is a brilliant piece of legislation. It’s introduced a right to know that now seems an important part of our democracy; and by and large I think it balances this right with the need to ensure that public services can be run effectively. It’s met all of its objectives to some extent or another – the Ministry of Justice had already put forward plenty of evidence of FOI making the public sector more open and transparent; I also pointed out how it was allowing campaign groups to engage better with decision makers. I argued that it was almost certainly improving decision-making; and I put forward a defence against suggestions of a “chilling effect”. The limits of cultural change within the public sector was one of my key themes. I pointed out that whilst senior figures such as former Prime Ministers and Civil Servants were openly and aggressively attacking the legislation, it was always going to be difficult to win people over. In future these attacks need to be aggressively countered from within Whitehall if FOI is ever going to become embedded in our organisations and its full benefits felt. And linked to that, we can’t ignore those who make requests irresponsibly. The requesters who submit the same request to hundreds of public bodies; the people using the Act to pursue their personal vendettas; and others who don’t understand that the way they use FOI will affect whether it survives. 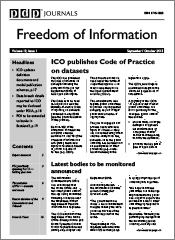 I’ve proposed a Code of Practice for requesters – an FOI “highway code” to promote good practice amongst those using the Act – rather like my Guide to Making FOI Requests. I’d rather see education than litigation used to manage issues with FOI. I don’t want to see transparency go backwards in the UK. I’ve called for any changes to be subject to a transparency impact assessment, and I’ve also asked the Committee to bear in mind the commitment the current Government has made to transparent and open public services. I want to see more proactive disclosure, and public authorities encouraged to introduce Disclosure Logs if they don’t already. But I agree with those who think that Publication Schemes are unnecessary to make this happen. I’ve also suggested statutory reporting on compliance and asking requesters to say when they are making a request under FOI. And I’m very keen to see the limitation on prosecution under s.77 of the Act extended beyond the ridiculous 6 months that it stands at now. Finally, I’ve argued against changes to the fees regulations. I fear that the changes that some have suggested could limit legitimate and reasonable research, so I hope this won’t be a change put forward by the Committee. If there must be changes, let’s focus them on those who use the Act irresponsibly – I think the restrictions on vexatious requesters are probably adequate as they are, but perhaps they could be clarified and maybe linked to the “Code of Practice” I suggested above. Fundamentally, now is not the time for change. 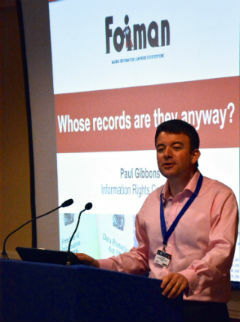 At this time of economic uncertainty, when Government and public services are making difficult and challenging decisions, the scrutiny that FOI offers is needed more than ever. Let’s hope the Committee’s post-legislative assessment reaches the same conclusion.